“The Devil’s Triangle” is a New York Times Bestseller! Congratulations to the team at Gallery Books and Catherine Coulter and J.T. 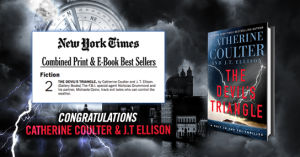 Ellison for The Devil’s Triangle hitting the New York Times Best Sellers list at #2!